Two ancient artists competing against each other: Zeuxis paints grapes so realistic, that birds try to eat them. Parrhasios paints a curtain ‘hiding’ his painting, which is so realistic that the other artist is fooled: Zeuxis isn’t able to perceive Parrhasios artwork as such at all because it is too realistic. An old question: What should be called ‘art’? Is it a subjective interpretation of reality, or an objective depiction that could be mistaken for reality? Does art, in the first place, have to be interpretable as art – before one can interpret its contents? A beautiful example is Pere Borell de Caso (1874), “Escapando de la crítica“, or “Escaping Criticism”, where a boy seems to step out of the painting’s frame which is also painted. Interestingly, this painting could also be interpreted as ‘avoiding the discrimination’ between what is real and what is virtual; or a hint that the framing of a medium, a framing which usually generates safety, can be incorporated in a work of art. As with a game, we can expect that content stays within the magic circle of the medium, and behaves true to the rules of the medium: A painting does not move or change, it has no (interesting) backside or depth, it stays in one place and does not follow us around. Do you know Oscar Wilde’s famous 1890 novel “The Picture of Dorian Gray”? The “Nightmare on Elm Street” movies? Fincher’s movie “The Game” or, one of the latest addition to this genre, Suzuki’s excellent “The Ring”? See the similarity to Borell de Caso’s painting with a girl getting out of a TV-screen in “The Ring” (US-remake from 2002). The horror, when a medium does not behave as expected…! One starting point for the shift of what could be seen as art in the early 20th century was Marcel Duchamps (1917) “Fountain”. His ‘sculpture’, a mass-produced pissoir, was in an art exhibition (i.e. the given cultural frame for showcasing high art); but obviously to contemporary visitors it was not art (obviously a irritating transgression of the cultural frame). The question arises: Is it sufficient to give an object the status of ‘artwork’ by getting it into an exhibition? 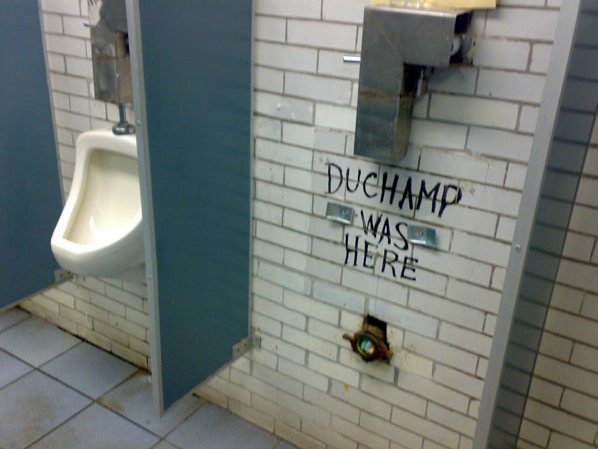 The legitimacy of an ‘exhibition’ as well as the boundaries of the cultural medium of ‘art’ were questioned by Duchamp by this simple piece of porcelain! Joseph Beuys‘ art sometimes suffered a more dire fate: A dirty bathtub and fat, heaped up in a corner of a room (german: “Fettecke”), were not recognized as artworks and cleaned – i.e. destroyed – by the janitors. Janine Antoni (1992), “Gnaw” (gnawed on lard cube after its collapse). Cover picture from Martha Buskirk’s book “The Contingent Object in Contemporary Art“. Is it characteristic of contemporary art to bring with it the question whether it is art at all? So, what do we call ‘art’? And what do we call ‘education’? When do we not recognise something as ‘art’ anymore? What are ‘art’s’ stabilising institutions and boundaries? What are the (external? internal?) agents that ‘threaten’ this institutions and boundaries? And how can these questions lead to a – necessary? – transformation of the notion of ‘art’? These are fundamental questions also for Pedagogical Media Theory: Just replace ‘art’ with ‘education’, and start with new media as contemporary example for a threat to education’s traditional forms. Christina Schwalbe for example showed in her text similar questions and developments for academic teaching and ‘new’ media through the ages (scripture, printing press, computer); Heinz von Foerster does so for different cultures or worldviews, e.g. in his “lethology” – knowing that you do not know, so you can know; knowing about blind spots. We see the frame and the content; and we learned what to expect from the content and the frame: education and enculturation. There is a similar phenomenon with art, and works of art. This entry was posted in art, culture, education, transmediality, unusability and tagged art, avantgarde, culture, Duchamp, paintings, trompe l'oeil, von Foerster. Bookmark the permalink.